Helen's World of BPD Resources Helen's World is a do-it-yourself compilation of thousands of annotated Internet links, focusing on sites and articles that contain significant amounts of information. Helen includes overviews and summaries of information and has the most comprehensive BPD resource listings on the internet. Borderline Personality Disorder Sanctuary Recovery information for people with the borderline personality disorder. Ask the Dr., latest research regarding etiology and treatment of the borderline personality disorder, with suicide information. New book information and much more. Kathi Stringer's Mental Health Review Features articles written by Kathi Stringer whose style is a very scientific approach to understanding BPD. This site, on the Toddler Time Network also includes sections for Borderlines, for non-borderlines, and for helping professionals. BPD Central BPD Central is a list of resources for people who care about someone with borderline personality disorder (BPD). 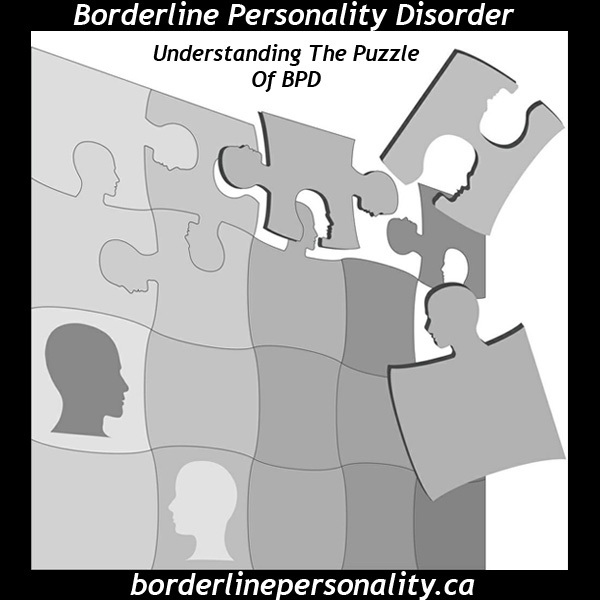 It is one of the oldest and largest sites about BPD on the web. Features books, email lists, and lots of helpful information primarily for non-borderlines with some information for borderlines as well. Pat Mc Clendon's Clincal Social Work.com Numerous articles on dissociation and splitting, PTSD and other things relevant to and experienced within the reality of BPD. Borderline Personality Disorder Today Information, BPD Advocate Program, Ask the Therapist about DBT, research, chat transcripts, author interviews, membership section, newsletter, communities, family section, resources, email volunteers, bookstore, personal stories and much more.